Whether directly or indirectly, Klonopin has an impact on every aspect of brain functioning. 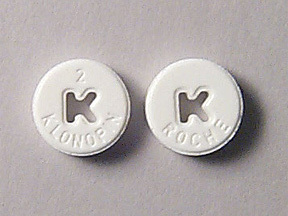 Commonly prescribed to treat insomnia, anxiety disorder, seizures, convulsions, and often acute symptoms of alcohol withdrawal syndrome, Klonopin is highly addictive. Short term therapeutic uses, generally less than 4 weeks, can be highly beneficial, but, long term use causes many adverse physical and psychological effects including profound withdrawal syndrome upon cessation of use. Klonopin withdrawal and lead to harmful psychological effects. Withdrawals affect brain activity, the central nervous system, peripheral nervous system, and autonomic nervous system, all at once, and the person will probably feel like they are on the worst roller coaster in their life. Insomnia, nightmares, and sleep disturbances are rebounding effects from the sleep deficits incurred during Klonopin use. Once the REMS, dream state sleep, deficit is made up, nightmares should subside, but, the insomnia and other sleep disturbances may take much longer because of the high anxiety levels and overactive state of mind. Panic attacks are the rebound effects of an anxiety state resulting in storms of central and peripheral nervous system hyperactivity, especially in those areas of the brain that control the fear and flight responses. Autonomic nervous system responses may occur with or without panic and include elevated respiration, heart rate, and blood pressure to extreme highs. The person may have difficulty breathing or feel like their chest is going to explode. This can also result in symptoms of nausea, vomiting, diarrhea, or other gastrointestinal problems, excessive sweating, urination problems, or pain. Sensory hypersensitivity is heightened sense to sight, sounds, touch, tastes, and smells that can be disturbing or extreme. Hallucinations, paranoia, and perceptual distortions can be terrifying and lead to other bizarre or psychotic behaviors. Depression, mood swings, suicide ideations, and other emotional instabilities may be some of the most dangerous symptoms that can intensify over days of withdrawal and last weeks or months after last Klonopin use. Muscle spasms and aches, result from rebounding increases in muscle tension which can affect joints, limbs, back, neck, jaw and cause tension headaches. Depersonalization occurs from anxiety states that makes it seem like the person is detached from their body or observing things from the outside. Bodily sensations are caused from hyper excitability in the motor and sensory nerves. The person may experience strange tingling or feeling of electrical shacks, “pins and needles”, numbness, hot and cold flashes, itching, or a deep burning pain. Problems with coordination and balance can make the person feel unsteady on their feet, feel like they are being pushed from side to side, or feel like things are spinning from equilibrium loss.